Plot: An assassin helps a young woman avenge the death of her family. Starring: Martin Compston, Tina Maskell, Eben Young, Stephanie Dooley. distributed by Saban Films «The Hunter's Prayer» in the US dvd and blu-ray release date was set for August 8, 2017. Rent from Netflix and Redbox from August 8, 2017. 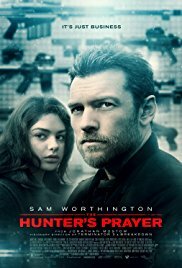 «The Hunter's Prayer» in the UK has no theatrical release date. The movie released on dvd and blu-ray on September 4, 2017.